When Nufarm announced its partnership with Golf Course Superintendents Association of America (GCSAA) in the creation of the EXCEL Leadership Program last fall, they believed it would benefit future golf course management leaders in the months and years to come, but didn’t envision strides so quickly. 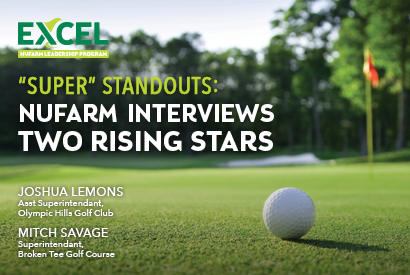 EXCEL offers leading-edge development opportunities for 12 assistant superintendents chosen from many excellent applicants. Each EXCEL class assembles three times per year for a period of three years to learn leadership training in areas such as career, community, and industry stewardship. 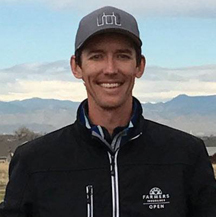 This year’s inaugural class joined their first meeting at the Golf Industry Show in February, followed by sessions at GSCAA headquarters in Lawrence, Kansas in April. The team will meet at Nufarm in Alsip, Illinois, in October. Nufarm had a chance to interview two inaugural EXCEL Leadership Program class members – both earning recent career promotions – to gain their thoughts on the program. Q: WHAT’S BEEN YOUR EXPERIENCE WITH THE EXCEL PROGRAM? A: I am looking forward to the rest of the program because all the material that has been presented so far has been amazing. For me, the biggest thing has been knowing that there’s an investment in me. On a golf course, when you get into the heat of the summer you start to get tunnel vision. You’re heads down…almost stuck in a rut. But to be a part of this program made me feel that I was a part of something so much bigger than myself, something bigger than the course I am working at. It really helped me feel connected to the industry. It’s has brought a new energy to my career and the people around me are excited about it. Q: DID EXCEL HELP SUPPORT YOUR RECENT PROMOTION? A: When we were in Texas for GIS I got to sit in some of the classes for professional development, resume building and interview skills. I thought all the information is very valuable, but I didn’t see myself using it for at least a few years. When I got home I ended up applying for another position using all the resources that I had gained while there and I took a new position. I felt like I was extremely prepared for it. It was amazing and great timing for me. I gained knowledge that I can put into practice every day. Q: WHAT DID YOU THINK ABOUT YOUR TRIP TO GCSAA? A: Being a part of GCSAA and the EXCEL program is something that’s bigger than yourself. Going to the GCSAA headquarters, going through their museum, and getting to know some of the previous presidents really puts things in perspective. We had a forum discussion with current and previous superintendents and industry leaders where we could ask about the state of the industry, the future of it. There was a wealth of knowledge in the room that I wouldn’t have if it was just up to me. It would take years to build a network where I could have that type of knowledge. To have it right in front of me, right away, at the beginning of my career, has been huge to me. Q: WHAT ELSE DO YOU BELIEVE YOU’LL GAIN FROM EXCEL? A: Teamwork is a big thing for me. Golf courses tend to be crazy and there’s always a lot of chaos around. The morning meeting happens and then everyone spreads out fast and they’re going every which way. We get so caught up in having people do these tasks that we forget about the people. I want to develop a team. I want them to feel we are investing in them. I am looking forward to learning more about how to be more of a leader in that sense. Q: ARE YOU ABLE TO HELP GUIDE CURRICULUM FOR FUTURE MEETINGS? A: Every session we’ve had together, at the end, they ask, “What can we do? 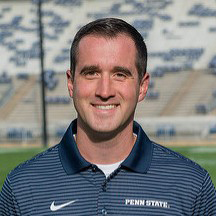 What would you like to talk about or learn?” That’s been really neat for me that they’re tailoring for this group of assistants and that it’s helping to build the curriculum for the following years. A: The biggest thing about this program so far is that I’ve had the chance to meet, connect, and start making really good relationships with 11 other highly motivated individuals in this industry who are assistant superintendents and, like myself, on the cusp of making that big jump in the industry. What I am looking forward to as we progress in this program is growing with those individuals. In 20 or 30 years from now, we’re more than likely to still be close friends. Also, meeting the people who are with Nufarm like Steve and Cam and Katie Beth, just making those connections, has been tremendous for me professionally and personally. Q: HAVE THE SESSIONS BEEN OF BENEFIT TO YOU? A: During the trip to GCSAA we had the chance to really interact 1:1 as a small group with some of the big names and the leaders in our industry. There was a panel discussion with Shelia Finney, Bill Maynard, Alex Stuedemann and Sandy McQueen. We were able to just bounce questions, concerns, and ask for insight. It was so relevant to what the 12 of us in this program are going through. The majority of the questions were submitted by our group so it was valuable to hear the questions and hear answers from people who have walked in our shoes. A: They’re so great and always asking for our input…what we wanted to see in our next trip. We’ve been focusing a lot on leadership. If I didn’t have any itinerary going into it, I would go into the meeting in October planning on talking a lot about career development, leadership and professional development, which is great. That’s what every single one of us in this program is passionate about and it’s helped where we have been and it’s going to help us get to that next level, too. A: I was accepted into the EXCEL program when I was still an Assistant Superintendent and then I actually was offered the position I am in now. The promotion happened on the day I was traveling to Lawrence for our second round of meetings. I would certainly think that me being a part of this program had something to do with the club’s decision to hire me. They saw that I was a part of this program and that helped me to stand out from the pool of other superintendents out there. That was how the timeline played out, which was cool because, during our first night in Lawrence, I got to share the news of my job offer. It was exciting. Q: IS THERE ANYTHING YOU WOULD CHANGE ABOUT YOUR EXPERIENCE OR THE MEETING AGENDA TO-DATE? A: No. It’s really fun to be a part of this inaugural class because when we get into Year 2 and Year 3 and see 12 more come on then 12 more come on, we can be mentors in a way. Like the panelists I mentioned earlier, we can be the people that the newer class comes to for questions like “What has this program done for you? What are some things you’ve seen and heard throughout these past three years?” It’ll be fun to go through the program, but at the end of it it’ll be fun to help the newer people in the class as well. I think that will be a very rewarding part of the program. It will always be cool to be able to say that were part of the inaugural class. I could go on for a lot longer, this has been a really great program and everybody I’ve met with Nufarm has been outstanding. It’s been first class all the way around.